As many American track fans caught their breath on a weekend falling between college conference and regional championship weekends, and professional track meets on each coast, KIMbia athletes still found themselves plenty busy in competition at several excellent, if less widely-covered, events. With many KIMbia athletes making their States-side homes in Boulder, it was fitting to have so many of them run before the hometown crowd. Each year, following an all-comers citizens’ race, the pros take to Boulder’s streets in a race scored by national affiliation, and, this year Millicent Gathoni — the defending champion — and Jane Gayunki led the Kenyan team, finishing 5th and 8th, respectively. In the men’s competition, KIMbia was represented on Team Kenya, Team USA, Team Commonwealth, and Team Colorado, with John Yuda our first finisher, notching a 3rd-place finish for Team Commonwealth. Boulder-resident James Carney followed Yuda and was the first American finisher in 4th place. 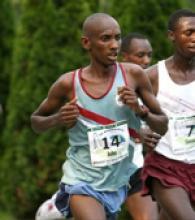 Other Top 10 finishes came from Gilbert Okari (6th) and Charles Munyeki (7th), both competing for Kenya. Locally-based Jason Hartmann took 12th as a member of Team Colorado, and Fasil Bizuneh would represent Team USA in 15th. Across the pond in Nairobi, Lineth Chepkurui continued to assert herself as one of Kenya’s top females, taking home a double win at the Kenyan Armed Forces Championships. Lineth won the 10,000 on Friday in 32:47, and came back Saturday for a victory and 15:58 clocking in the 5,000.